The first game to use a “science process” game mechanic to explore process of science ideas. In this case, a closer look at the use of model organisms – – in genetic research. Download free printable full deck (55Mb pdf). Download Rules sheet only (2.6Mb pdf). Buy high quality deck (at revenue neutral prices). Deck Announcement – see this post and this post for details. This deck was created in an attempt to represent (as much as possible) the diverse nature of experimental narratives, techniques and specific organisms in the world of model organism research. This was clearly a difficult task, but the design team tried to encapsulate as much of this diversity as possible. You are a busy geneticist working on multiple research projects using model organisms. At the end of the day, you want to complete as many projects as possible. Projects can be completed by collaborating with other scientists or by working independently. Let the science and games begin! The objective of the game is to obtain as many points as possible. The player with the most points at the end of the game is the winner. Points are gained by completing Project Cards. In order to complete a Project Card the appropriate combination of Resource Cards must be collected. Points from any uncompleted Project Cards are subtracted from your total score at the end of the game. This deck contains a total of 74 cards which includes 16 Project Cards and 58 Resource Cards. This game is best for 2 to 5 players. Players obtain points upon completion of Project Cards. Each Project Card requires a specific combination of Resource Cards which must be assigned to the project in order to be completed. The number of Resource Cards required to complete a project is the number of points collected by the player upon completion. At the end of the game, uncompleted Project Cards result in negative points equal to the point value of the card. Note that there are some mandatory project cards. These are not worth points, but if not completed will result in negative points! Resource Cards include Species cards, Research Technique Cards, and Modifier Cards and contribute to completing Project Cards or impeding other players. Species Cards: An organism needed to complete a project. Research Techniques Cards: Research techniques needed to complete a project. Modifier Cards: When these cards are played, the described effect is activated immediately unless stated otherwise. There are 4 main card “piles” in the game. 1. Resource Card Pile – contains the Resource Cards face down. 2. Project Card Pile– contains the Project Cards face down. 3. Discard Pile – contains discarded cards face up. 4. Burn Pile – contains face down Resource Cards used to complete Project Cards and used Modifier Cards. Once the Resource Card Pile is completely used, the Burn Pile is shuffled and replenishes the new Resource Card Pile. Each player starts with a hand of two Resource Cards, and one Project Card. Decide who goes first! Every turn consists of three basic phases: A draw phase, an action phase and a discard phase. 1. Draw: At the start of their turn, the player draws two cards from the Project Card Pile, the Resource Card Pile or the Discard Pile and in any combination (ex. 2 cards from the Resource Card Pile or 1 card from the Project Card and Resource Card pile). The player must pick up both cards before looking at either of them. Only the top cards in the Discard Pile can be drawn (ie. Cannot sort through Discard Pile). 2. Action: The player can now choose to do as many of the following actions during their turn. i) Start and/or work on a project. To start a project, place a Project Card face up in front of you. By doing this, you commit to finishing the project. If you do not finish it, you will be deducted the point value of the project at the end of the game. There is no limit to the number of projects you can work on at the same time. To work on a project, place resource cards from your hand beside the project card on the playing field that requires that resource. A project is completed when you have acquired all the Resource Cards needed for the project and placed them beside the Project Card on the playing field. Take the completed Project Card and set it aside. Place the associated Resource Cards face down in the Burn Pile. iii) Use a Modifier Card. Modifier Cards are Resource Cards that give you special abilities. They might help you complete your projects or disrupt another player’s project. iv) Collaborate with another scientist. Sometimes it may be in the player’s best interest to collaborate on projects with other players. During a collaboration, one Project Card from each player is pushed together so the top of the cards are touching. Resource Cards are placed beside the Project Cards. If both projects in the collaboration require the same Resource Card, only ONE Resource Card of that type is needed for both projects. Once the requirements for BOTH projects are completed, each player takes their own Project Card and can claim the associated points for THEIR project at the end of the game (ie. The players only receive the points for their project in the collaboration and do not share the points for both projects). – Both players must agree to the collaboration for a collaboration to happen. – Collaborations can only be initiated if no more than ONE Resource Card is already attached under each of the projects. (ie. If you are working on a project and have already put two resource cards on it, you cannot start a collaboration on that project). – You may collaborate with as many players as you want, with a maximum of ONE collaboration at a time with each player. For example, if there are 4 players, you may have a maximum of 1 collaboration with each player at a time, for a total of 3. 3. Discard. At the end of your turn, you must discard cards from your hand into the Discard Pile face up if your hand size is LARGER than the number of projects you have in progress. For example, if you are working on one project independently and one collaborative project, you can hold two cards at the end of your turn. If you have no active projects, you must discard your entire hand. Project Cards can be held in your hand, but do not count towards the hand size limit. Additionally, only Project Cards in your hand may be discarded (ie. Active projects cannot be discarded). When the last Project Card is drawn from the Project Card Pile, the next player to complete a project ends the game. After this player finishes a project, all players get one more turn, then the game ends and players tally up all their points: positive points for completed Project Cards and negative points for unfinished Project Cards left on the field. The player with the most project points wins the game. For example: Dave completed a 4-point Project, a 2-point Project, and has an unfinished 3-point Project. He gets 4 + 2 – 3 = 3 project points at the end of the game. Game Design Team: Sidney Ang, Genevieve Leduc-Robert, Lu Li and Sam McKinnon. Art by Amy Dale, Maki Naro, David Orr, Claudia Stocker, and Joe Wierenga. Card back design by Suzanne Norris, Phylo logo by Haley Fiege. Special Thanks to David Ng, Phil Hieter, and the GSA Education Committee. 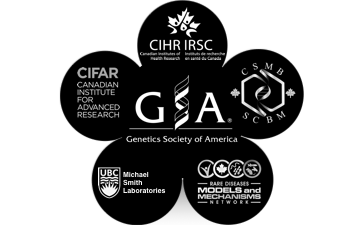 Support from the Genetics Society of America, the Canadian Institute for Advanced Research, the Canadian Institutes of Health Research, the Canadian Society for Molecular Biosciences, the Michael Smith Laboratories, and the Canadian Rare Disease: Models and Mechanisms Network.